Real birds that is. 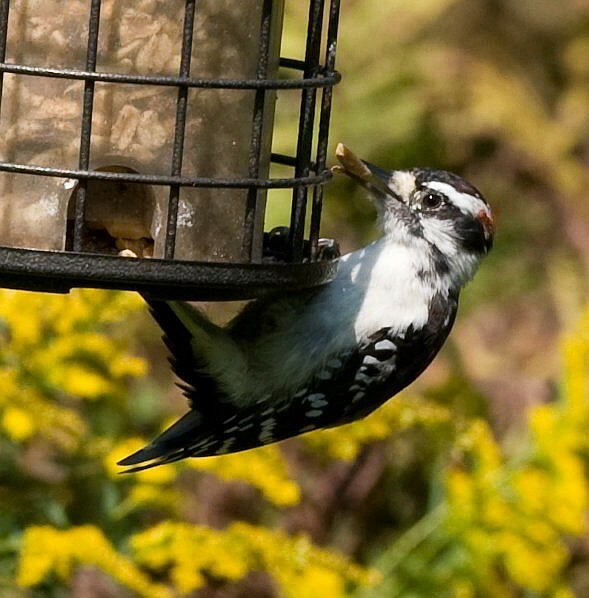 Living at the edge of city we get quite a few birds hitting up our feeders; sometimes, they fight over them. 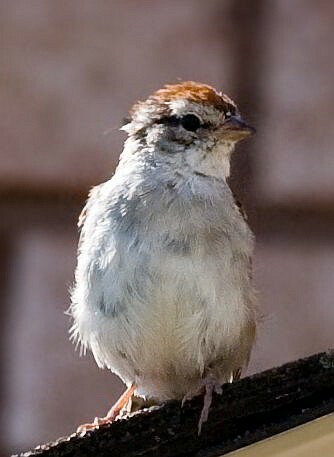 We have three good sized bird feeders on the front porch, and in the back yard, an old feeder my dad built that feeds a number of small birds in their own cubbyholes. The holes are small to keep the squirrels and larger birds out, so the feeder is suitable for the small yellow finches, the little sparrows and wrens, and the tiny chickadees. The feeders at the front porch dispense the feed onto a bottom platform and we generally get sparrows and yellow finches, but also find ourselves inundated with starlings, and on occasion the large crows and blackbirds try to feed off them too. When there’s a fight over the feeders, they swing back and forth spilling the millet and sunflower seeds onto the front porch, bringing the doves who prefer to feed off solid platforms as opposed to swinging bird feeders. Having a pond and birdbath with moving water adjacent to the feeders also helps bring the birds into the yard. Not far from our house is a large wooded area open to the public which is known as “Grants Woods”. This used to be a private estate, and on the grounds is a fieldstone house and a large gazebo at the side yard. This gazebo has a picnic table and benches around the edges, with feeding platforms for the birds. Nearby are a number of feeding stations for the birds too. We discovered on a recent outing that if a person sits at the gazebo, you can see and photograph the birds without frightening them away. On that particular day, I was only equipped with a 200mm lens, so I wasn’t able to get as close as I’d have liked. If you leave the gazebo to move closer to the feeding stations, the birds disappear in a hurry. We’re planning another trip out there to simply sit and watch (ie: photograph) the birds, but this time I’ll be taking my 400mm lens and tripod and setting it up in the gazebo. 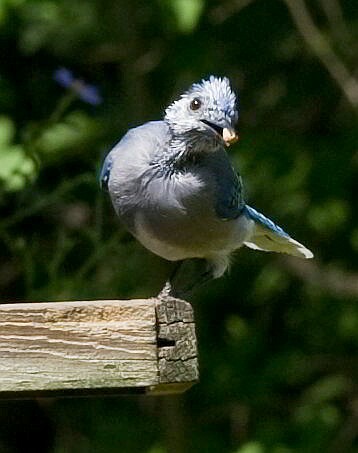 This last trip I managed to photograph a young bluejay, and a pair of hairy woodpeckers (male and female), along with a sparrow, who appears to be able to share the feeder with the bluejay and not get into arguments. But besides those I managed to capture, there are yellow finches, and tufted titmouse, and I’m pretty certain I also saw a cedar waxwing. I was hoping to find a cardinal, but we were only at the gazebo for a short period of time at the end of our treck through the forest and woods. 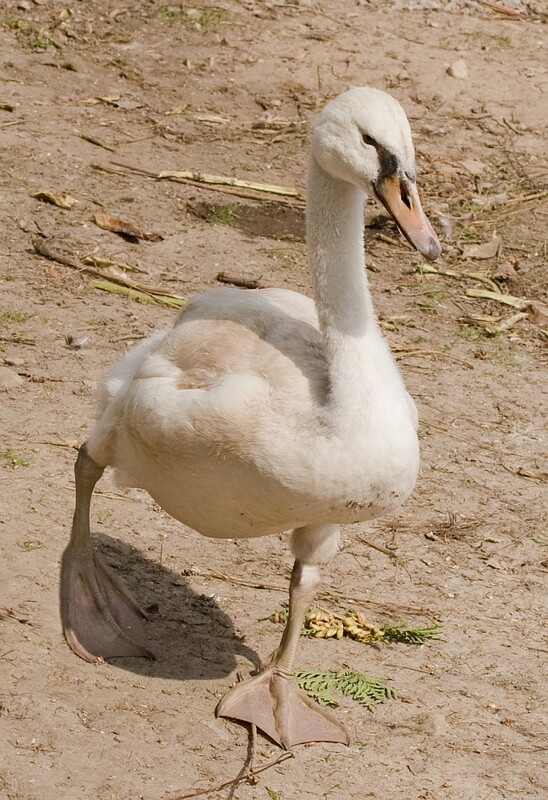 A quick hop from there on our way home and we were at the sanctuary (hard place for me to stay away from), where we got a look at this year’s crop of baby mute swans; they’ve grown from small bundles of fuzz into the youth stage, though they are only about 4-5 months old right now. Of the four babies, two are white, and two are brown (the brown is most common until they are adults, with white babies being less common). The Orillia Fish & Game Conservation club have been working in the swan pond and fixed up an area that was quite overgrown. They’ve removed some of the wilder undergrowth and patched up some areas with gravel and generally have spent some time cleaning up the area. 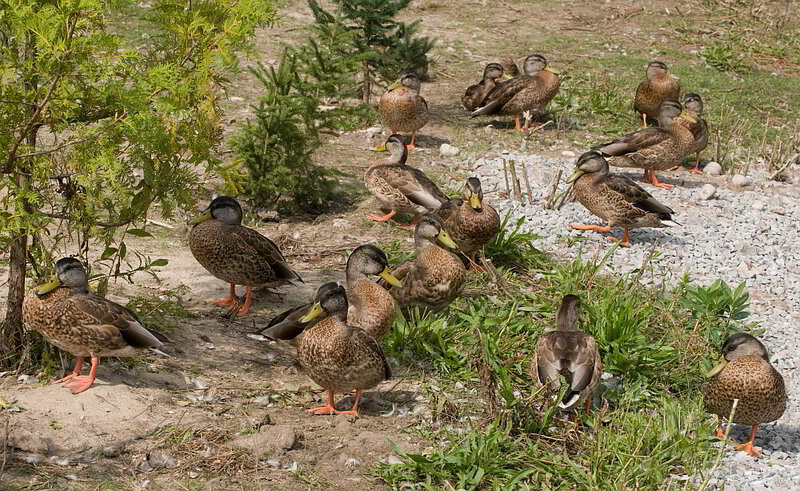 I was rather surprised at the number of ducks resting in this area – generally you might see two or three ducks at the swan’s pond, but on this trip there were more than a dozen sitting quietly in the cleaned up areas near the gravel beds. The swans seem happy enough to share their compound with the ducks, but don’t tolerate the geese very well. On this trip we took along a couple of heads of lettuce to feed the swans (they eat greens or corn) and as my husband approached the fence they lined up side-by-side to receive their greens. It was funny to see them in a neat row like that – most of the time they are stepping on each other to get to the food, although they certainly don’t go hungry. The pond is full of growth for them to feed off, and the OFGC has a member feed the swans every day with boxes of greens and corn, and of course at some point through the day, there are always visitors to feed them.